You Can Always Make a Difference No Matter Who You Are. This is written for anyone who wants to make a difference in the world and thinks they have to be something else to do it. It's also for anyone interested in dawah but thinks they have to get more knowledge, be a better Muslim or change who they are before they do dawah. If a group of college kids can do it, so can you. Today my husband's last hair was gone. I couldn't help the sadness that surfaced from seeing it. If you're thinking my husband & I lived a long life together and this hair is the last one on his balding head, I say to you: I wish it was…but Allah's will is superior to all. My husband passed away years ago. We lived a normal married life. We had our ups & we had our downs. The rooms of this house are filled with memories. They have laughter from all the funny moments we shared. There are dried up tears on the couches where I clearly remember crying & thinking "Did I make a wrong choice in marrying this man? ...should we work it out or separate?" Grief & Accounting = Messy & You can do it. Back in August, I wrote 90% of this but didn't send it out to my newsletter because I thought it was silly. However, I promised myself, I would always show up for my tribe in full transparency wherever + however I am. And as I re-read it today, I realize that maybe its message is something that you may need today. I hope it comforts you in some way reading about my process with grief, courage, procrastination and feeling all the feels. TRUTH: I applied a lot of make up this past week to do accounting and paperwork. I put so much make up, you'd think I was going to a wedding. Why did I put on a full face of make up to do paperwork, you ask? Good question. Pull up a seat. Lemme share my story. So as everything is wrapping up. I get some bad news: Oh by the way, you need to submit an final accounting of every penny that has gone in and out of this estate, its businesses and accounts. HOLD UP. SAY WHAT?????? JAW DROP. My shocked look says it all. Me: Ummmm No. He was debarred for something he did with another client and not allowed to practice law anymore. So here I was. Stuck and needing to do this. I geared up. I put it on my daily schedule over and over. Sent kids to grandmas. Got friends to hold me accountable. Got coaching around it. And.....didn't do it. I'd try again and sabotage my own efforts. Like the grocery store trip that took me 8 hours for 7 items. Yes 8 hours. I was doing everything to hide. I didn't want to do it. I'm the girl who hates tax season. I hate the feelings that come up with adding pennies and dimes. So imagine having to figure out the accounting for an estate that had several businesses, assets and a corporation among other things for 12 years and a flood had damaged some of the paperwork along the years. Definition of Nightmare. I sat with all of them. Felt all the feels. As I let myself feel these emotions and the time passed, I realized hiding from this was doing me more harm than good. I put my big girl pants on and started to reflect and ask myself some deep questions. Ok Fatima: (me talking to myself) What is it that you need to do this paperwork? How can you make this a fun experience? Something inside of me laughed at the word fun. I ignored that laughing part and I persisted. How can you make this fun for myself? Don't ask me why, but make up came to mind. Remember that 8 hour shopping trip? New lipstick may or may not have been purchased that day. So one morning, I sent my kids to the babysitter's and applied a full face make up like my life depended on it. I did more paperwork that day than I had done all my life. It felt great. And I also cried because I really missed my daddy. I did the same the next day. And the next day. With all transparency, the accounting is still not done. This isn't a Cinderella story. I have tons more to go. Life will happen. I will set it aside and then go back to work on it when I have some time. However, I've learned to sit with the feelings, then ask myself "What is it that I need right now to do this?" In the beginning, it was for this experience to be fun. Then as the process evolved, it was that "I need to connect to my daddy doing this." So when I'd sit at my desk, I'd be intentional about noticing things that reminded me of him. Things that were all around my home/office but never stopped to give them much thought. The wooden boat that I bought reminded me of a similar boat he built. The wrought iron lamps that were salvaged from the house he was building. It sounds silly but this was a part of my grieving process. People don't expect grief to happen 12 years later, but it can happen any time. You decide what you want to feel and how you want to use it. Another example is as the process evolved, the answer was that I needed more info so I'd set up a meeting with the lawyer or some other business specialist, depending on what the question was. This week, it was "I need more support with my kids." So I asked my mom to come stay with me for a week. The answer will be different. Life is not about cookie cutter solutions. But if I'm willing to listen and show up, the answers are there. And the other MORAL of the story: If you come over for tea suddenly, don't be surprised to see me all dazzled up. I'm just doing paperwork. P.S: please keep me in your prayers while I'm working to trying to finish up this accounting. P.P.S: the question process I used on myself is outlined alone here in this post if you'd like to read more about it. Do you procrastinate? Pull up a chair and join the club. A couple years ago, I could have won an award for how much I procrastinated. It started somewhere when I was young and just stayed with me through college and adulthood. Here’s something I've learned along the way from greatly reducing this habit. As procrastinators, we have specific words we love to use. One of those words is Later. Return those pants to the store? Later. Organize the master bedroom closet? Later. Here's my tip, after you say the word "Later"..... Ask yourself: Why Later? Next time you remember something you need to do and think “I’ll take care of that later.” Ask: why later? (Note: Watch your tone. Not “why later” with a finger wagging attitude and demeaning tone. But with genuine curiousity and love for the person that you are.) If you listen closely, you’ll actually give yourself the solution to stop procrastinating that task. You see a shirt you need to return to the store and think “I really need take care of that. In sha' Allah I'll do it later.” Ask yourself: why later? Why do I really not want to do this task? So take care of THAT first. Solve that answer and you will be more likely to do the task. So for example, to solve it, you may think "Hmmm if the lines this time of year are what's stopping me, what can I do to make the lines more enjoyable? Now, start coming up with solutions. Take my headphones and listen to a podcast? Delete old emails on my phone while waiting in line? Take a friend I’ve been meaning to meet up with and grab coffee after we return the item? Hmmmm, you wonder and possibly set action items to shed the weight you've gained and set a date on your calendar 90 days from now to return the shirt if you haven't lost the weight. Knowing the answer to "why later?" will give you deep insight into the reason you’re really procrastinating. Solve that and you're one step closer. Let me know how this works for you. Constantly in a rush? Mulitasking like your life depends on it? Can't seem to put your phone down? Your to do list is a mile long? This audio post is about what happened to me when I was reaching for my phone, even during a small walk...and what I realized. You'll hear a lovely water fountain in the background that will make sense in the end. I hope today you'll breath a little slower and deeper. I hope you'll hug your loved ones. I hope you'll take your time in your prayer instead of speeding through it. And I hope you stop and look around at the beauty that is everywhere. There's always time for enjoying the current moment. During Ramadan, I had iftar at the masjid and was dreading the moment it was time to leave. My toddler was beyond sleepy and I was making dua that she doesn't have a full.blown.meltdown. When my kids need sleep, they're psycho. Your kids too, maybe? I was preparing myself to be that mom... the one with the crying screaming kid disturbing everyone. Breathe and smile. Your smile will calm her. This phase will pass. Soon she won't be a toddler and these days will be over. Season of life. You can almost touch the door. Just get her shoes on. But she was fussing even more as we approached the door to put her shoes on. Because toddlers are smart. They know shoes = leaving. Just then a sister walks by and caught me by surprise. Normally when I pass another mom in a situation like this, I give her a look that says: I feel you. I've been there. You're doing a great job. ...and I keep walking. I expected her to do the same. Huh? I said. She caught me off guard. I heard it but I don't get what you mean, I said. I knew what it meant as a phrase. But in this specific situation, what more could I do? I was doing my best to be patient. I was trying to be calm. What was she seeing that I wasn't? When she gives you a hard time, just renew your intention. Just say to yourself: I'm raising a believer. I'm raising a believer for the sake of Allah. Suddenly, my whole body relaxed. I thought I was handling the situation quite well. But reminding myself of that simple fact made all the difference. I'm raising a believer for the sake of Allah. And when I see it like that. I feel different. I am different. It's no longer an anoyyance. It's a choice. Yes. I AM raising a believer. And when she behaves this way, it's a chance for me to choose again. To remember why I became a mama. It's a chance to remind myself why I'm smiling and being patient. Because I'm raising a believer. It was so simple. Renew your intention. In motherhood. In your marriage. In your business. In Islam. And everything else. I hope this article gives you something you need right now. Please keep the sister who reminded me of this in your prayers and if you'd like to be on my newsletter to get more articles like this, join me here. What's Going On Deeeeeeep Down? To get to the bottom of what's going on deeeeep down, sometimes we have to ask ourselves good deep questions. Why am I mad? What am I really angry about? Why did that comment bother me? What is it I really want? If money wasn't a problem, what would I do? These questions are not meant to get you to doubt yourself. They are meant to give you information about what's going on inside. This information is the real deal when it comes to communicating clearly. I'm mad because you disrespected me. Please don't do that again. Here are two suggestions you can try next time instead. Sometimes we go in circles around the real topic. Normally it's because we have not had practice asking ourselves with good questions. And that's all it is. Practice. Start asking yourself deep questions, eventually you'll figure out exactly what question you need to ask to get to the "juice" of what you need to know. 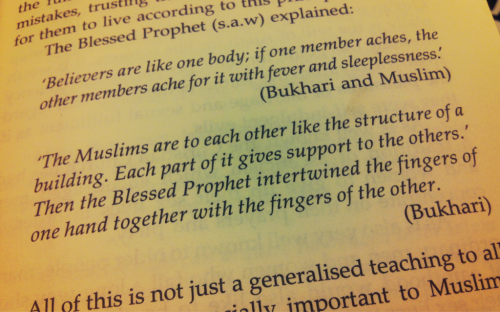 "Each part gives support to the others." that feels so right. That we support one another. I've needed that support before. I will need it again. Find your sisters. The ones that support you when times are hard. They're out there....probably aching and needing you too. I hope this website is a part of that support and gives you comfort when you need it. Listen or Don't. That's not what matters most. Whether you listen or not-- do it from a place of self-empowerment, not fear. A place built on pleasing Allah. It's going to take courage. It's out of your comfort zone.